all the images in the AMV are exposed in the (almost) same sequence from the film. I started this project in november 2005, so in two month (approximately 100 hours) i study After Effects 6.5 and create this video. It was my first experience with AMV and After Effects, but i’m a code developer and i already know concepts like ‘keyframes’,’layers’ etc, so i understand quickly how this software works. In the first pre-release, the video had many effects on it, but before the official release i removed many of the effects to create a more ‘clean’ videos, but i don’t remove the subtitles. This was a wrong choice…. In march 2006, i re-render the video without subtitles and better quality (with some encoding tips from my friend rei.andrea), available as ‘direct link’. 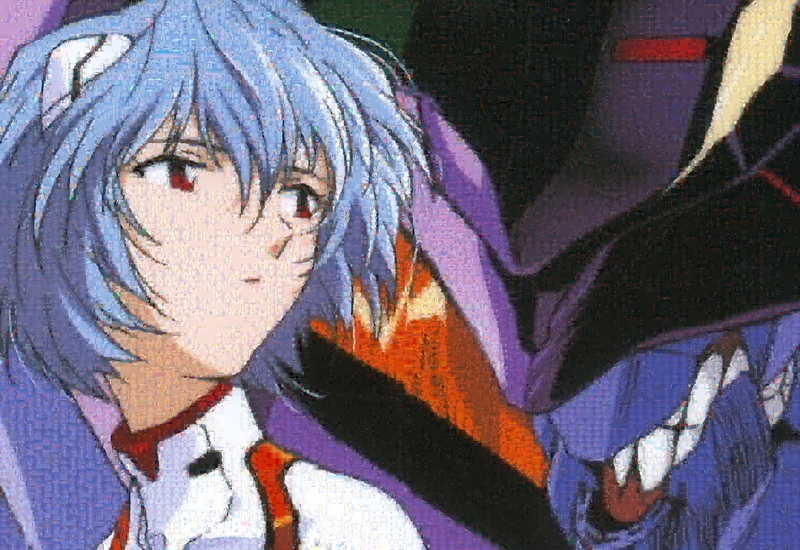 Here you can download the jpeg of the mosaic used in the intro, it’s a mosaic of Rei and Eva01, made with all frames of the films ‘The End Of Evangelion’ with AndreaMosaic free software.